commodorified | "Think we'll turn back? YOU DON'T KNOW JACK." "Think we'll turn back? YOU DON'T KNOW JACK." City Hall was good. No pre-organisation to speak of, no speeches; just a big quiet hugfest. Someone read Jack's letter, and at one point there was a piper; I don't think anyone appointed him, as such, he just showed up and played. Later, a woman up on the ramp began to sing O Canada, beautifully; everyone joined in. I saw/talked to/hugged/ended up at the pub with/check as many as apply zingerella, chickenfeet, lemur_catta, northbard, tormenta, trouble and several more friends, plus there were some I expected to see but who were out of town or couldn't get there or we just missed each other. I wanted to take ... I don't know, something. Flowers didn't seem right. So I bought a couple of boxes of chalk. And, as both benet and fairestcat texted me to say, I accidentally ended up on the CBC website. When I was done I left the chalk on the ground by the ramp, and ... things got sort of splendidly out-of-hand. I tried at one point to count the languages on the wall, but gave up. Mostly English, but French, Spanish, Greek, and I think Mandarin, as well as Vietnamese and I know not what all else. Other sizes and the rest of Blackbird_012's great pictures of today are here. ETA: and zingerella made the Globe and Mail. Oh My God.... You are an inspired and inspiring woman! That was a good response. I got lucky ... usually I think of these things on the way home. How lovely. And how fortunate you were to have a politician who inspired such an outpouring of grief and love. I can only think of a couple of pollies here who would elicit anything near the response for your Jack Layton, and I'm well aware that one is largely disregarded and the other is loathed by a large section of the population for his politics. Which is sad. That is a beautiful way to remember someone. Oh my gosh, it got a lot bigger after we left. I'm happy. Are you still in Toronto? I think I heard you say you were leaving ridiculously early this morning, but if you are still in the city I'd love to see you again before you leave. <3! I feel like "things got sort of splendidly out-of-hand" is the best possible summation. Aha, it was YOU who brought the chalk! Excellently done! We're lucky you use your powers for good. From what I've been reading, Jack Layton sounds like he was a mensch, and Canada was lucky to have someone like him. I was in Toronto last October; we stayed right by Toronto City Hall, and walked through the plaza every morning. It was fairly quiet then, but I'm glad I have that experience of the space to reflect on when looking at these pictures, the swell of hundreds, thousands of people paying tribute. Amazing. 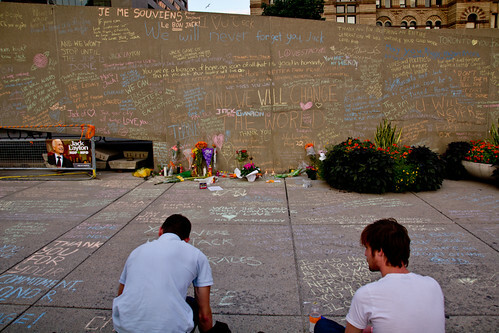 I'd never heard of Jack Layton before yesterday, but this moved me to tears. Thank you. That's wonderful! Thanks for sharing. When you life runs its course, you can look back and say, honestly, I once did something utterly brilliant and good for the world. That there was a good thing you did. The bagpipist made me smile. And I mean this in the best possible way, but Jack Layton appears to have been a bit of a nerd when he was younger. this is just incredible! what a wonderful idea. Thank you so much for the wonderful idea of leaving messages. I voted NDP in a federal election for the first time this year (I live in a Liberal stronghold that went Conservative), and it was because of Jack Layton. This is so sad. 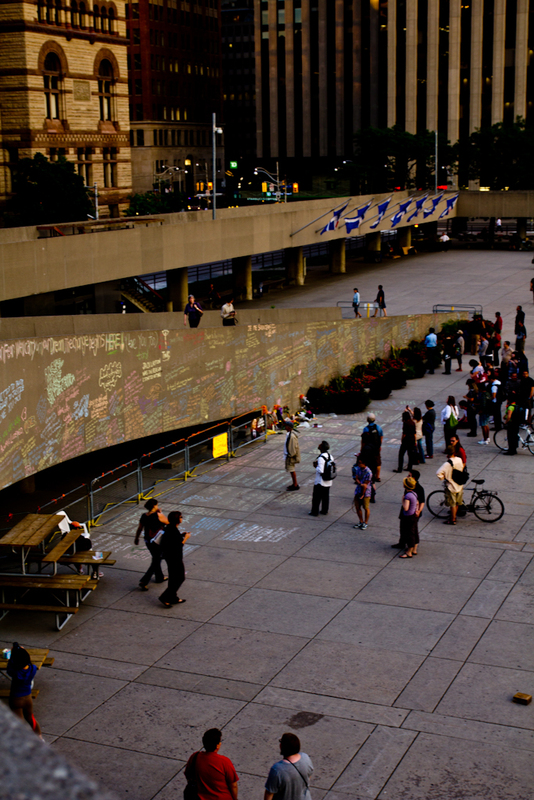 What a wonderful tribute to Jack Layton and all because of your boxes of chalk. That's really something. I mourn with my Canadian friends who have lost an inspiring leader. What a beautiful tribute you started for him. HI ANDREW HI HI HI! ...I actually had, but I filed it in my head as "A politician," and forgot it was him. And things continue to get even more splendidly out of hand! I admit I hadn't heard of Jack Layton before this, but he must have been truly special to have earned this kind of tribute. That is amazing. Thank you. I am lucky to know such epic folk as you. You are awesome. Thank you for starting a beautiful thing. I adore that photo. Was wondering where I might track down a copy, and here it is. Thank you! You're welcome! FYI, according to Toronto Star, the photographer is Scott Rogers. Made me sob in front of my monitor, no lie.